If you have been searching for Lake George vacation rentals that are a step above the rest, consider a deluxe park model rental. 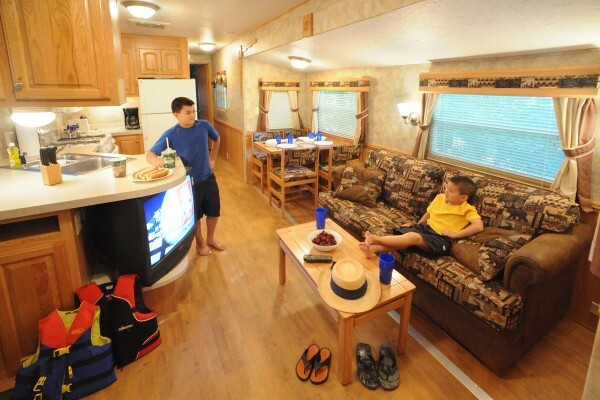 Our 40-foot park models can comfortably accommodate a family of six, and they offer amenities you just won’t find in hotels, cottages, cabins or other forms of lodging in the Lake George area. And the fun? Oh yeah. What makes our luxury park model rentals such a desirable choice for Lake George lodging? Room to kick back – Check out the spacious floor plan of our Lake George park model rentals. Celebrate the changing seasons – Spring in the Adirondacks is spectacular, and our comfortable deluxe park models allow you to enjoy the best of both worlds, inside and out. Explore the region – We are just a short drive from Vermont and all the Adirondacks have to offer. An eco-friendly vacation – Our park model rentals offer the best in a green getaway. Our Lake George Wilderness Lodging guests enjoy the same amazing amenities and services as our campers. Call us at (518) 792-3775, or contact us online to make your reservation!